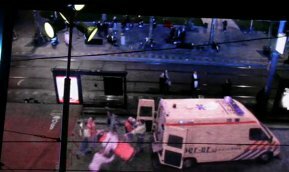 I personally think that this is a terrible situation, but the people of the Netherlands have a problem with public service employees such as paramedics being attacked while doing their job. What makes this problem even greater is those who see such crimes often do very little to stop them. I can understand why people would want to avoid being hurt, but some people who pass by such scenes don’t even bother to call for help. There is a new public service message that involves a billboard and augmented reality technology. I’ve discussed augmented reality before, and this is the first time I have seen it used like this. Check out a video after the jump to see it in action. What happens is that the billboard shows some studio-made footage of an assault on some paramedics, but the augmented reality adds people passing by and doing nothing. These people who are passing by are shot by hidden cameras and placed in the footage in real-time. Talk about an object lesson! Man, if this doesn’t show people that they should get involved, I don’t know what will. I wouldn’t mind seeing this billboard outside of the Netherlands. Something like this could prevent any more Kitty Genovese cases. For those of you who aren’t aware of Kitty Genovese, she was a woman who was stabbed to death near her New York home. This incident was witnessed by thirty-eight people, and not one of them called the police. In the video, it shows four steps of what to do if you see something in the augmented billboard. It would probably be best if we all did them. Whoa, that got preachy. Then again, it’s hard not to be preachy when talking about issues like this.